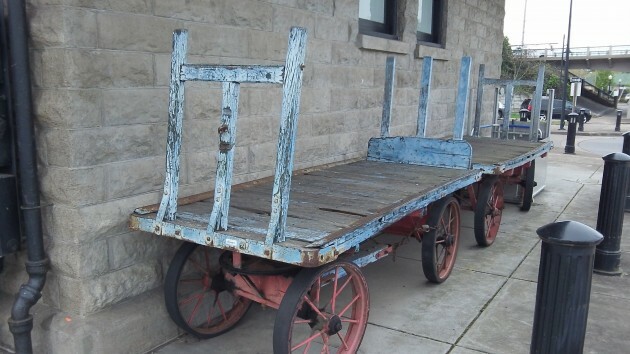 Unlike these vintage baggage carts at Albany Station, passenger rail has a future — if more people ride the trains. The Cascades passenger trains that stop in Albany four times a day have been rescued for now with a funding package that cleared the legislature on Thursday. But only an increase in the number of paying passengers can save them for good. Running the trains for their two daily round trips on the line between Portland and Eugene will cost the state a projected $28.1 million for the 2015-17 biennium. Of that, $6.6 million is covered from the sale of custom license plates. And the federal government is contributing a one-time grant of about $6.9 million from programs intended to reduce traffic congestion and air pollution. Without the infusion of money from the general fund, the trains would have had to stop running as of this week. Most Republicans in the legislature want to quit spending money on the trains, which they consider a waste, and for a while this spring it looked as though some Democrats were willing to do the same, partly because ridership had dropped last year. Now, the state subsidy for Cascades train travel amounts to about $52 per one-day trip on average. This needs to be sharply reduced, and the way to reduce it is to increase ridership or charge more per ticket. Amtrak, which runs the trains, charges $28 for a one-way ticket from Eugene to Portland. This is more than reasonable and not much higher than what Greyhound charges, according to a recent comparison published in the Portland Tribune. It probably costs more to take the freeway, considering all the costs including fuel, insurance and depreciation, not to mention parking your truck when you get there. AMTRAK is the federalized version of the Seattle Mariners (or, Chicago Cubs for us older folks). Lots of romantic, historical attraction that attracts fans in the short term. But year after year we realize before the all-star break they are lost in the wilderness of mediocrity and incompetence. I no longer choose to spend my scarce disposable income on losers. And we can’t afford to continue to subsidize this loser called AMTRAK with scarce tax dollars. There are higher priorities. Let’s be real. AMTRAK is an anachronism. It’s time to end the fantasy. Spoken like a true retiree living a subsidized life and driving a rickety old Saab. Nine stops and over six hours of travel time, along with the need to arrange transportation at each terminal, is not a recipe for peace of mind or refreshment to me. Throw in a wasteful subsidy to stew about I’m pretty grouchy by the end of the trip. Yes — SS, minimal PERS, and investments do make retirement reasonable… And “rickety old Saab[s]” are my hobby – I’m sure you have yours too. Simply put, the mental agitation of driving to (and through) Seattle in today’s traffic definitely is not relaxing for me at all. We park at the station here and my brother “chaperones” us at the other end. What’s not to like? I’m very much looking forward to our trip next month to Vancouver BC. The train is great and comfortable. Taking the extra time, and savoring the journey, sure beats the freeway.